We are pleased to offer free tea or coffee with any order from the main meals menu during Northumberland Restaurant Week. Go to the bottom of the page to claim this offer! Ron and Cath Ridley and their daughter Victoria would like to welcome you to Harleys. We are open all year round and offer a warm welcome to our customers whatever the weather! 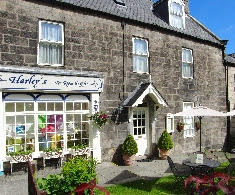 We believe that Harleys is unique in its qualities and is a special place to visit and our aim is to provide you with a friendly and relaxed service. We like to think that Harleys is a place where you can sit back, relax and feel at home in our comfortable surroundings; if you keep returning to Harleys - as so many people do, we are sure you will begin to feel like one of the family. Our dishes are largely homemade and prepared only with the freshest ingredients.